On August 8, at 00:24 an emergency call was received to “911” service that a car accident had occurred at the beginning of Tairov village, Armavir Province, a car had crashed into a petrol filling station and flamed up. 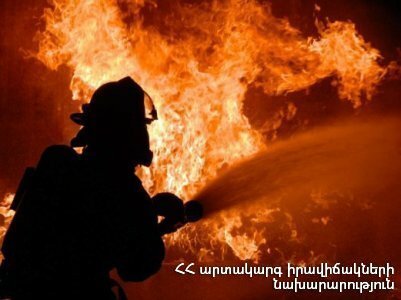 11 fire brigades from the fire and rescue squad, the emergency response and operative groups of the National Crisis management Center of the rescue service and the duty group of the "Center of Disaster Medical Treatment" of MES of RA left for the scene. It turned out that an unknown car had crashed into the charging tower of the petrol filling station at Mayrakaghakayin Street 90. As a result of the collidion a fuel leak with fire had occurred from the tower: there were no casualties. The fire was isolated at 01:20 and extinguished at 02:04. The petrol filling station (about 50 m2) and 4 refrigerators burnt. The rescuers patrolled the scene until transporting of fuel from tanks to gasoline carriers. The minister of the Emergency Situations of RA Hrachya Rostomyan and the director of the Rescue Service of MES of RA, r/s colonel Artak Nahapetyan were at the scene.